Forming communities seems like a lot of work. It involves finding the right people, the right topics and the right venue. They need to be self-organising and people need to be engaged. But it’s something we’re keen to do for digital people working in health to help build digital capability and this is how we’re going to do it. Luckily, we’re not starting from scratch so we’ve dubbed these new sessions as a bit of an alpha. Up til now, we’ve had regular meetings with our ‘ALB digital leaders network’; the department has 16 agencies and arm’s length bodies (ALBs) in total and we govern digital projects in all of them. The network was formed of digital decision-makers in those agencies we needed to engage with to coincide with the introduction of the digital spend controls back in 2013. 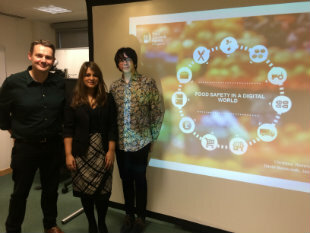 The Food Standards Agency digital team hosted our session on social media insights in 2015.
Who attended: the right people weren’t in the room for the right topics and it felt like we were working on an assumption that everyone had the same digital capability. Why we were holding the sessions: there were no clear actions and nothing seemed to happen in between the six-weekly sessions. 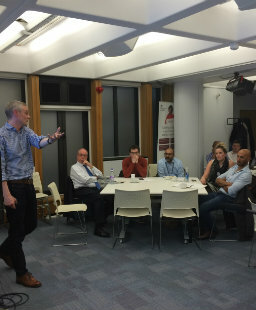 It was useful to hear from James Ashton from GDS on running the cross-government agile community (these lessons were blogged by Jock Busuttil), which we’ve taken on board to iterate what we have so far. So, here goes. Guest speaker Mark Thompson on digital platforms. We’re going to establish 3 networks: service transformation and standards; content; and digital engagement and host separate sessions for each. The sessions will be aimed at a generalist audience as it wouldn’t be possible to expect our health colleagues to self-categorise into neat digital practitioner roles: some of our agencies have big digital teams with a service delivery arm and others are a 3-person communications team responsible for service delivery. We’ll continue to signpost to the well-established government communities out there for digital specialists such as user researchers, product managers and content designers etc (full list below). Engaging a community on digital techniques will in turn help build digital capability. Attendees like sharing resources and knowledge and want to reduce duplication across the system. The meetings so far have been really useful as a simple networking opportunity to join up on similar projects. This is why we’re keen to have a community in health rather than simply pointing to existing ones. We’ll keep the practical and interactive format, using the initial session to do some needs gathering to set some topics for future sessions. We liked James Ashton’s tip to define a vision at the beginning of workshops so everyone has the same understanding of how the session would benefit them. 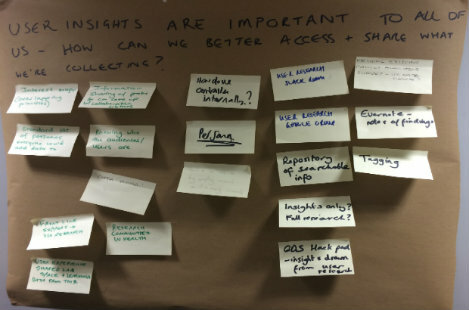 Gathering ideas on how to share user insights across health. A community manager is a full-time role at GDS. We don’t have this role in our team, so we’re pitching in as a team, with a bit of nudging from me as delivery manager. We can’t build these networks and communities on our own, so a kind plea from us to our digital health family: be active participants, offer ideas and when these sessions really get going, help us with the logistics! Our first session is on 21 June for those working in service transformation and standards. We’re asking everyone to share a project they’ve worked on and a challenge they’ve faced. We’ll prioritise any trends we find and these will drive the agenda for subsequent sessions. There will be session on the modern communications operating model in July and a session for content designers in August. I'd love to hear from other government departments on being part of or running a community - tweet me @hongatdh or leave a comment below.